To be more precise, people in 19 European countries, along with Australia, eat healthier foods than Americans. For anyone who has traveled in Europe, this is not a surprise. Grown for taste – not hardiness or long distance travel – luscious fresh fruit and vegetables are enjoyed everywhere and just about every western European meal is plain old yummy. Making it official, however, A new fact-driven report comparing America’s food system to 125 other countries, has just been published by non-profit, advocacy group, Oxfam, based in Oxford, England. Analyzing data from World Health Organization, the Food and Agriculture Organization of the U.N. and the International Labor Organization, Oxfam measured families access to fresh produce and nutritional proteins, the affordability of these nutrients compared to less healthful options and and how their diets impacted the country’s overall health. Using these measurements, Oxfam was able to rank the best and worst places to eat around the world. 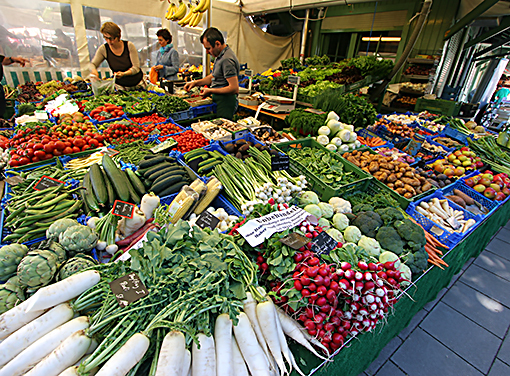 The Number one country with easy access to healthy, affordable foods was the Netherlands. France and Switzerland shared the number two spot. The worst countries for finding healthy diets were Yemen, Madagascar, Ethiopia, Angola and Chad. The Us did even worse in the health category. Only five other countries had higher rates of diabetes and obesity than the US. Our poor showing is linked to poverty. Although food is very cheap here in comparison to other countries, poor Americans don’t have affordable access to fresh vegetables and fruits for a balanced diet. Cheap foods centered on fast, processed, packaged foods do not a healthful diet make. The overall global picture of the report shows that one in eight people go to bed hungry every night, even though there is sufficient food to feed them all. How is this possible? Oxfam’s report chalks it up to overconsumption, misuse of resources and waste, along with the new practice of diverting food from human consumption into biofuels. Yes, crazy. It’s all about profit. Did you ever read The Omnimore’s Dilemma by Michael Pollan? He has some interesting commentary about food and poverty in the US. Access is definitely an issue, but he claims there’s also powerful incentive to spend on the least healthful calories because they’re the cheapest. I just slogged through the slush after our big snow storm yesterday. Amazing how city workers can make 12 inches of snow disappear so fast, without any help from melting temps. Going for another frigid single digit temp tonight. VERY glad for my two quilts!